If pasta dishes mean lots of ragu, cheese and yielding spaghetti or linguine, it might be time to get out of your comfort zone. An easy amatriciana will show you that pasta dishes can have a light zing and a spicy kick. The recipe originates in Amatrice in the Lazio region near Rome. Nobody puts too much emphasis on authenticity though, and it's fine to tweak the recipe to suit your tastes. A little chopped bacon or pancetta is the base of the sauce, lightly fried with some fine chopped onion for about 4 minutes until it is beginning to brown. Chilli is not a common ingredient in Italian cuisine, but it provides the characteristic flavour in amatriciana. Add one small and finely chopped chilli. You don't want the fiery heat of Asian cuisine, but just a subtle hint of heat. Cook for a couple of minutes. At this stage add the tomatoes. If using the canned variety (and everybody does), drain off a little of the liquid, otherwise you will need to cook the sauce for longer to reduce it. Cook for about 15 or 20 minutes to allow the chilli heat to flavour the sauce fully. Traditionally this sauce accompanied bucatini, the long thick tubes of pasta that resemble a cross between spaghetti and macaroni. It's a very satisfying pasta and works well with the sauce, although spaghetti or linguine would be fine alternatives. Forget the Parmesan. 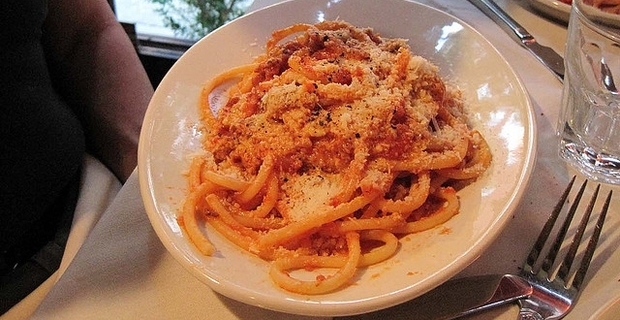 A true amatriciana should be served with pecorino cheese, and not too much of it.